To research values for Antique Furniture of any type or style and period, please see our Price Guides to search through millions of priced results and appraise yours. In the last quarter of the seventeenth century, as one historian writes, France dominated Europe, not only by the success of her arms but by her achievements in art and taste. Paris was the capital of fashion, dictating even to the court of Charles II across the Channel. The magnificence of the Sun King, Louis XIV, found its perfect expression in the Chateau of Versailles, where the royal residence was established in 1682. To furnish the vistaed galleries and great symmetrical salons of this palace, artists and artisans were commandeered from all over Europe and marshaled at the royal manufactory of the Gobelins in Paris. Not only tapestry but ‘ebenisterie’ (cabinetwork) and all sorts of metalwork were executed here under the direction - or, as many thought, the tyranny - of Louis' court painter, Charles Le Brun, who passed on every individual design for furniture and even, it is said, gave their models to the locksmiths. In fairly dazzling contrast to that of earlier reigns, the furniture made for Versailles is elaborately carved and gilt with dull or burnished gold, even, sometimes, made of solid silver. A balanced combination of curved and straight lines, many broad surfaces richly ornamented but never broken by projections that cast shadows, sturdy baluster or bracket legs and, in the latter part of the period, swelling bombe fronts, made it as imposing as the ‘Grand Monarque’ himself in his robes of state. In its rich vocabulary of decorative motifs, it seems to praise its master in the terms he loved best, with laurel wreaths and figures of Victory, trophies of war and the chase, horns of plenty and symbols of the life-giving sun. A typical form is that of the console made to hold a single large precious vase of goldsmith's work, porphyry, or jasper in front of the long mirror that reflected its luster. Chairs served prestige rather than comfort; rigid court etiquette accorded a ‘canape’ (sofa) or ‘fauteuil’ (high-backed armchair) to higher degrees of nobility, a ‘tabouret’ or stool to a lower. 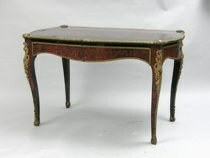 Cabinets, tables, desks, and clock cases might be made of ebony or other exotic woods and covered with the intricate marquetry in tortoiseshell and brass, chased and inlaid with lines of enamel, pewter, or copper, invented by the Alsatian ‘ebeniste’, Andre Charles Boulle (also spelled Boule and Buhl). During the reign of Louis XIV, the whole output of the royal workshops went to Versailles and others of the royal chateaux, to princes of the blood, and to ministers of state. The great nobles and the wealthy bankers who underwrote the regime called on lesser artists to imitate as best they might the splendors of Versailles. But when, in 1715, the old king died, ruined by his disastrous wars, the newly enriched commercial class had already become the chief patron of the arts. The regency of Philip, Duke of Orleans (1715-1723). saw a short period of inflated wealth the like of which Europeans had never known before. The "Mississippi Bubble" speculation made thousands rich overnight. The mood of the day, a reaction to the gloomy end of the last reign, was optimistic, happy, and pleasure-seeking. It was bound to be reflected in furniture design, which became light, graceful, and elegant. Comfort and convenience, instead of magnificence, were now desired. As in England about the same time, social life became more intimate and less ceremonious. Houses were built with smaller rooms, each having its own use: the ‘boudoir’, the writing cabinet, the ‘petit salon’ for receiving friends. Their furnishings were designed to serve the general comfort and special occupations of the inhabitants. The variety of small tables for writing, needlework, or card games, elaborately fitted with drawers, screens, removable trays, and even pierced tops for growing plants, well illustrates the point. Chairs become smaller and lighter, so that they can be pulled about as conversation dictates. 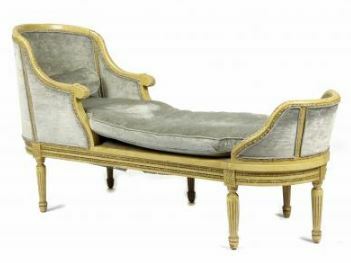 Along with the comfortable ‘bergere’, the ‘lit de repos’ or daybed, the ‘chaise longue’ in two or three parts, and the ‘ottomane’ or low sofa, all cater to a new degree of ease. The most readily recognized characteristic of this Louis XV furniture - though we must remember that it had begun to emerge in the preceding reign - is the omnipresent curved line. The profile of typical chair and table legs is an elongated S. In armchairs, the legs, the arms, the arm supports, even the uprights of the back and, finally, the shape of the seat are overcome by the curve. These undulating lines that flow into each other without a break, with almost never an angle at their junction, with a living, feminine grace represent the greatest contrast to the severe rectangular forms of most Louis XIV furniture. In decorative detail, the spirit of the new era shows itself in a taste for the free, the unexpected, the capricious. The style ‘rocaille’ (as we call it today) used the natural forms of rock and shell, cascading water, and curling leaves in asymmetrical arrangements of which the engraved designs of Meissonier and Oppenard give the best-known examples. Among the great names in cabinetmaking were, under the Regency, that of Charles Cressent, whose bureau-tables are often ornamented with the gilt-bronze busts of women with wide collars, called ‘espagnolettes’; and, under Louis XV, the two Caffieri and the famous Oeben. The reigns of these French kings, we should remember, give us only convenient "labels" for the furniture styles, not hard-and-fast dates. 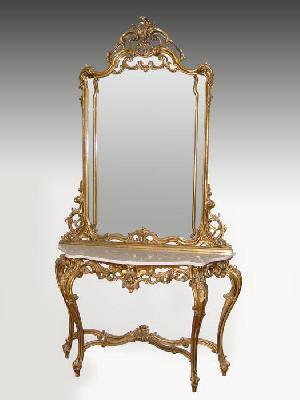 The style called after Louis XVI, for instance, came in well before that monarch ascended to the throne in 1774. Its keynote is the straight line - noticeable from whatever angle we view a piece of furniture. Chairs and tables, rectangular in plan, stand on straight legs that taper sharply downward. If few new forms were originated - and it is true that the preceding period left little to do in this respect - cabinet-making was carried to a peak of virtuosity by such masters as Riesener, Roentgen (also called David), and Gouthiere. Marquetry in tinted woods, painted panels, and porcelain plaques enliven the surfaces of furniture; carving is generally restrained. Pastoral motifs-shepherds' crooks and shepherdesses' hats, scythes, rakes, and watering cans wreathed with flowers - remind us of ‘le petit hameau’ at Versailles, the artificial village where Marie Antoinette played at rusticity. Along with a continuing vogue for ‘cloinoiseries’, the interest in classical decoration - stimulated by excavations in Greece and of Herculaneum and Pompeii in 1754 - influenced furniture design increasingly under Louis XVI. Laurel wreaths and fasces, medallions and classical figures are all-frequent in applied decoration. Parthenon-like Caryatids and crouching sphinxes support consoles and mirror frames. The Greek tripod may be copied for a table and the Roman curule chair for a seat. After the Revolution, this enthusiastic imitation of antiquity, combined with a new preference for massive, solid forms and the strong contrast of ormolu with dark, polished woods will prevail throughout Europe as the Empire style. 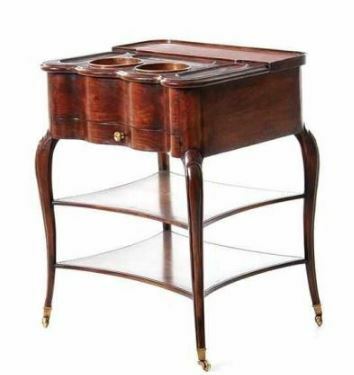 Early in 20th century, the attention of American collectors was drawn to the provincial furniture of France, which seemed to answer the needs of modern, informal living and to offer interesting comparisons with our own early furniture. "French provincial," however, is a term that is easier to illustrate than to define. It must be distinguished from "Provencal," which refers only to the southern province of Provence, and fitted into the framework of the "court styles" we have already mentioned. Most history books contrast the splendor and luxury of the court of Louis XIV with the poverty and squalor that existed in many parts of the realm; but it should not be forgotten that a rising middle class or ‘bourgeoisie’ - that is, townspeople who lived by trade or the practice of a profession - as well as a populous peasantry, were on the whole enriched by the Sun King's long reign. The house of a well-to-do farmer, about 1700, might have been sparsely but comfortably furnished with a great four-post bed and some straw-bottomed chairs, a trestle table and perhaps an ancient chest or coffer - nothing that would have looked new or unfamiliar to his ancestor of a century before. But the farmer's son might add an ‘armoire’, or wardrobe, to hold the piles of sun-bleached linen that measured the housewife's pride, a carved ‘dressoir’ set with pottery and pewter, and some comfortable armchairs in oak or cherry wood with turned legs and loose cushions. For as prosperity stimulated local industry every small town or village might have its cabinetmaker, competent to turn out such pieces "of sound, saleable wood, carefully grooved and jointed, and soberly ornamented," as the statutes of his craft required. The provincial cabinetmaker made two kinds of furniture. For the local aristocracy and prosperous middle-class townspeople he supplied upholstered armchairs (‘bergeres’ and ‘fauteuils’), ‘armoires’, tables for many different uses, desks, and ‘commodes’. The commode or chest of drawers (often and incorrectly called in English a bureau) was a typically eighteenth-century form, so named, a contemporary dictionary tells us, "because of its commodity." A whole family of smaller pieces with drawers – ‘chiffoniers’, ‘secretaires’, and work tables - are related to it. All the furniture echoed Parisian styles; its makers copied published designs when they had no actual models. It is a version, plainer and heavier, but with a compensating degree of vigor and forthrightness, of the Louis XV style we have already considered. 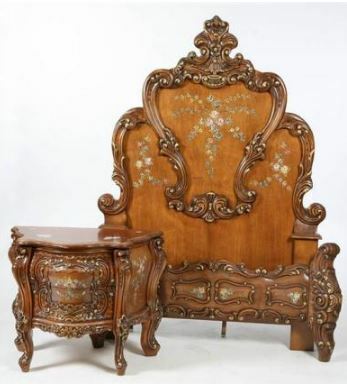 This provincial furniture was not greatly affected by the change of fashion which brought in the neo-classical, Louis XVI style; neither do we find the Empire style having any considerable influence on it. 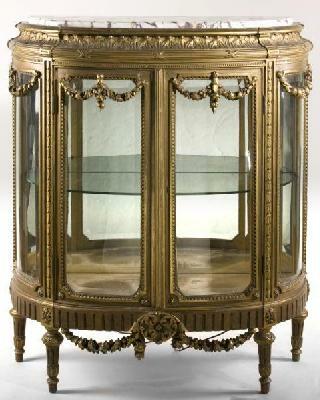 The basic Louis XV forms, however, continued to be made up to the very end of the nineteenth century. In Flanders the influence of the Netherlands is evident in the heavy carving, marquetry, and veneering of the great double-bodied armoires (called ‘ribbanks’ in this province). Artois and Picardy, also in the north, are notable for the variety and interest of their dining-room furniture; ‘bas de buffet’, ‘traite’, ‘etimier’, and ‘seillage’ are the names of some of these fairly elaborate pieces. 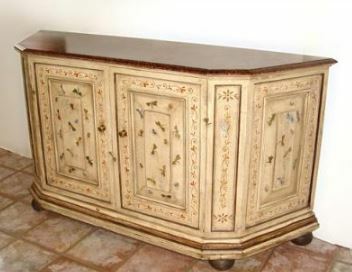 The peasant furniture of Brittany is heavy in its proportions and profusely ornamented. Besides the massive ‘lit clos’ with its wooden doors, a buffet with open shelves above, a double-bodied armoire with arched ‘fronton’ or pediment, and the ubiquitous chest, that serves for storage and sitting, would be crowded into the one-room Breton dwelling. Native oak stained ebony, chestnut polished or painted a brilliant red, and boxwood, for the turned spindles that run around all cornices and shelves, were the woods most used in this province. In Normandy, the humbler one-room farmhouse would probably have had a table, a buffet, and a grandfather clock. Two types of table were popular. One concealed a dough trough beneath its hinged top, the other had a central drawer and leaves on either end. The tall clock won the nickname of demoiselle for its curvaceous silhouette. The wealthy bourgeois of Normandy might have had a carved commode and an armoire of native oak; the Norman armoire is considered to be one of the finest types of French provincial furniture. Alsatian furniture is noteworthy for its colored decoration, carried out in marquetry or paint. Typical of the peasant furniture of mountainous Auvergne are massive armoires in the style Louis XIII, a peculiar type of chest-table with hinged lid, and the ‘table-bahut’, a table with drawers but with a low buffet at either end instead of legs - possibly the ancestor of the pedestal desk. In Burgundy, the massive construction and wealth of carving of the typical large, double-bodied buffets may be an inheritance of the Renaissance. Walnut is often combined with the light wood of fruit trees or with maple or ash in this province. The furniture of sunny Provence is perhaps the most original of all France. Its curvilinear forms, in native walnut, are often set off by polished steel hinges of lacy design. The Provencal marriage armoire - made for the bride from walnut trees her parents had planted on their wedding day - is one of the oldest of these forms. 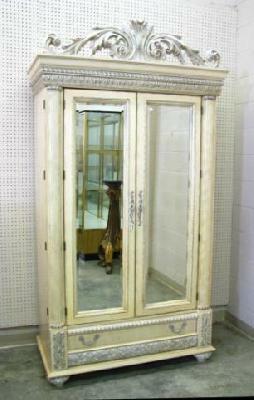 Like all provincial furniture in traditional styles, specific examples are hard to date exactly.